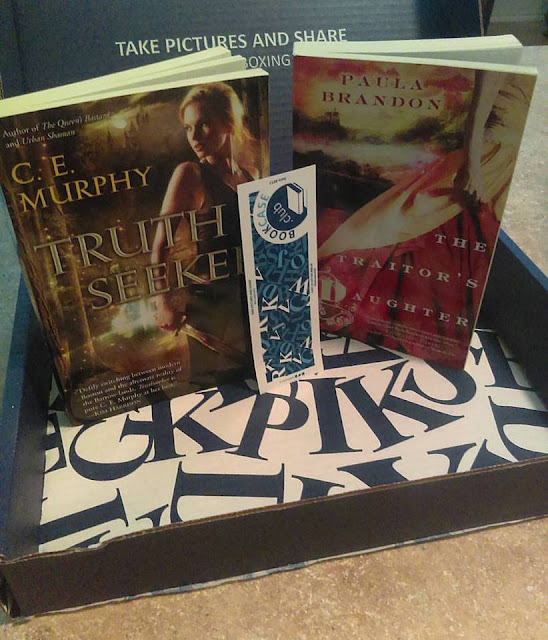 How many of you are excited to see what I received in my latest box from Bookcase.club? Every month I get so darn happy to open up my latest bookcase and see what's inside. This is what this month's box had in store for me. I'll start with the one that I am currently reading. Okay, so I'm reading this and I'm not exactly sure where the story is going, but it's really not too bad. The names are very unique as well as the non-so-human characters. It seems like something my husband might like to read. Gifted with an uncanny intuition, Lara Jansen nonetheless thinks there is nothing particularly special about her. All that changes when a handsome but mysterious man enters her quiet Boston tailor shop and reveals himself to be a prince of Faerie. What's more, Dafydd ap Caerwyn claims that Lara is a truthseeker, a person with the rare talent of being able to tell truth from falsehood. Dafydd begs Lara to help solve his brother s murder, of which Dafydd himself is the only suspect. Acting against her practical nature, Lara agrees to step through a window into another world. Caught between bitterly opposed Seelie forces and Dafydd s secrets, which are as perilous as he is irresistible, Lara finds that her abilities are increasing in unexpected and uncontrollable ways. With the fate of two worlds at stake and a malevolent entity wielding the darkest of magic, Lara and Dafydd will risk everything on a love that may be their salvation or the most treacherous illusion of all. This just sounds so appealing to me. I love faeries. Really! Ooo, and other worlds? Sounds so good to me. And a love story as well? I can't wait to read this one. I've mentioned it before, but in case you are new to my blog, Bookcase.club is a monthly subscription service. Yes, like all of those makeup and jewelry sub clubs out there, but for book lovers like myself! They have numerous genre bookcases that you can choose from, for not only adults, but kids as well. Check back next month to see what new reads I will get.